While grout can get dirty and cause your tiles to look dingy, you can clean it without much effort. In three simple steps, you can have your tile sparkling again. Before you can give your grout a heavy duty cleaning, it is critical for you to perform a preliminary cleaning. This step requires that you clean your tile as you normally do. If you are cleaning floor tile, sweep and mop the floor. If you are cleaning wall or counter tiles, spray them with your choice of household cleaner and wipe them down. The preliminary cleaning process will remove any scum and excess dirt. 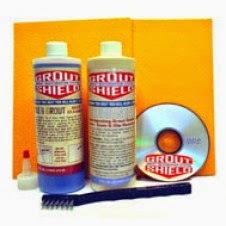 Put some quality grout cleaning solution into a spray bottle and spray all of your grout. Let the solution sit for five minutes to dampen the dirt. Allowing the solution to sit will make dirt easier to remove. After the solution has had time to sit, scrub the grout clean section by section using a hard bristle brush or a toothbrush. Be sure to spray more cleaner over each section as you clean. The wetter the dirt, the easier it will be to remove. After you have followed the cleaning process, be sure to wipe the tile free of all dirty puddles as these will be made during the cleaning process. If you are cleaning a floor, you can get the dirty puddles up by using a mop. If you are cleaning walls, wipe off the dirt using paper towels. When the puddles have been removed give the tile a normal cleaning one final time. Your tile and grout will look good as new.